A wide smile is prominent in many of Gina "Triple G" Hopkins' photos on her social media. She sports colorful and creative hairstyles along with her Brazilian JiuJitsu gis or her kickboxing gloves. Competitions fill up a large amount of her time, from Grappler's Heart to Strongman tournaments. The blue belt believes her purpose in life is to simply inspire others. After enduring a difficult road to where she is now, her desire is only to make a smoother path for other female adaptive athletes to follow. Gina was diagnosed with Dystonia at the young age of 10, a neurological movement disorder that can cause muscles to spasm and for the body to twist and disort itself. Rather than allow the disorder to define her livelihood, the UK-based athlete decided to find ways to make her life the way that she wanted to live it. An opportunity for neurosurgery arose in her teenage years, but in order to undergo the process, she first needed to get fit. Kickboxing was her first love and outlet, which led to other rewarding sports and exercises such as powerlifting, Brazilian JiuJitsu, and Mixed Martial Arts. Now the athlete competes regularly and is sponsored by the likes of Scramble, Celtic Strength, and Active Hands. Her work is far from over, however. 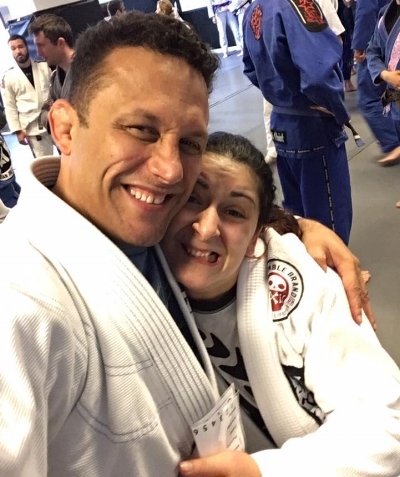 After creating Adaptive Martial Arts CIC, Gina intends to make a real defined space for other adaptive athletes to train, compete, and succeed. PA: What encouraged you to start kickboxing? GH: I started kickboxing in order to get fit for neurosurgery, which was pioneering surgery at the time. It was the only way of avoiding being put on lots of horrible medication and regular Botox. I developed Dystonia when I was 10 years old, and by 15, I knew I couldn't continue as I was. I had to take the chance of undergoing Deep Brain Stimulation at such a young age. Something in me told me that to get the best results of the operation, I had to build a support network and build my body to cope with whatever was thrown at me by this operation. Pain and fatigue doesn't even cross your mind when you are literally fighting for your life. Kickboxing had always interested me, so after some convincing, my parents relented to let me join a local club after some private lessons. That was a pivotal moment in my life. You've said that you rebuilt your body for the third time in order to compete Brazilian JiuJitsu. How does that feel to be able to accomplish that? Rebuilding your body after something that devastating is the hardest thing you can do, mentally and physically. You have to channel every emotion into coming out on top and keeping mobile. It’s the most exhausting, challenging, and scariest thing to desperately try to hold onto the mobility you've had, while being aware that you will eventually have to adapt. You are, in essence, fighting for your future. In honesty, to achieve that is bittersweet. I will never be happy with the mobility I have, but when I see people who have given up or those who settle for what they think they have to, I become more driven. I push myself for my own health. I also want to show those people who think they don't have any options, that they do have a choice. What is something you would like others to know about Dystonia, and how can people support you and others who have it? The only thing I would ask of someone who knew me, would be to ask me about my condition or educate yourself. I put myself in combat sports intentionally and I love it. I don’t want to be bubble wrapped. I actually enjoy using my condition to give me an advantage over some competitors. For example, my neck is extraordinarily flexible because of my condition. It's also incredibly strong, so moves such as stacking me on my neck, neck cranks, collar ties, or even chokes are all things I like people trying on me because I know I’m stronger than you! Go for it! Obviously, there a few things that I struggle with. I’m not agile or quick, and I can't move how I want my body to. I'm okay with it though. I know my limits, but it’s my limit, not my competitor's. Please keep your game as you would with anyone else my size and gender, it’s my challenge to adapt. I’m never going to know what I need to work on if you work to my weakness. There is obviously a fine line, but if you have some kind of vulnerability, then naturally in competition I’m going to exploit that. My team knows the days when I’m too tired to be pushed hard and be exploited, which is why it's important to understand me and my individual relationship with Dystonia. Sometimes it drives me, sometimes it drains me, but it never excuses me. As a female athlete competing in martial arts, is there any adversity you face that others may not? I guess that depends on how you view it. I use this idea to fuel and benefit me. There is no-one I can train with who is a complete match for me or will be in my category. There is the stereotype of being a "delicate female", so some guys will end up training "gently" with you. With the aforementioned, I try use them to my advantage. I will train with the stronger men so that the average woman cannot beat me. When men go too soft, I tell them and they can listen or get smashed. When you get that judgemental or confused look by the ignorant, that only encourages me to train and fight harder. My biggest challenge is finding match-ups. I look at the registers for competitions and there's hardly anyone in my category. However, since being promoted in rank, this has not such a problem. I look forward to testing myself against non-adaptive women, rather than adaptive men! Another issue is that opportunities such as sponsorship are lacking for women, and it can be difficult to get one based on your lifestyle. What is your favorite aspect of sports and competing? Everything! There is no single part of it that I don't love. I enjoy the fear, the adrenaline, the test, and even the win-or-learn aspect. I all too often feel these feelings in a milder form in hospitals, which isn't my choice. It's great to feel this in a positive manner, one which I control, choose, and love. What are you currently working towards and what would you like to do next? Currently I am looking to form a not-for-profit Community Interest Company (CIC) called Adaptive Martial Arts (often known as Adaptive MA). This is my primary focus, to bring the joy of exercise and Martial Arts to those who think they can’t participate, such as injured, disabled, or ill individuals. I am also doing a strongman competition which has finally incorporated adaptive women. Once this is done, I will be competing and campaigning in the non-adaptive tournaments in order to highlight the cause. Do you have a favorite memory from your time in training? I have many fabulous memories and have had wonderful opportunities, such as meeting the likes of Renzo Gracie and my brilliant competitors. I have two great memories, one momentous and one in competition. I will always remember the first time I heard Scramble was going to sponsor me… I was no-one, just trying to make a point to the small audience I had, and suddenly Scramble was supporting me! Hearing that and knowing I had the support of a world-wide brand gave me confidence, hope, and motivation. This was a turning point. A small-time tournament, a small-time adaptive athlete, these things just don't happen! They have been incredibly supportive of me, and even "happened" to be in New York when I was competing to help with my warm up and coaching! My second favourite memory is from that very competition. I managed to get the gogoplata from mount, and I ended up winning my category. When the referee called it, I genuinely didn't know if I’d been disqualified or had won. Thankfully, the latter. This was another turning point in my life. I knew I’d achieved what I had come to do and it was a huge turning point for my confidence. Was there anything that was particularly challenging for you? There was so much support for me to get into Grappler's Heart that it was really overwhelming! While Martial Artists tend to be community within themselves, Brazilian JiuJitsu is definitely a family. Teammates were willing to help me fundraise, but it was still difficult. Sponsors can be hard to come by when you are an adaptive female athlete in a male-dominated sport, and come by as a result of brute force! Luckily, I knew from my own academia I could do the training for it. The two challenges I face to this day are people's perceptions of me and maintaining my health. Both of these go hand in hand. Many often don't realize my sport is my physiotherapy. Every combat sport I train in is difficult for me for various reasons. That's why I enjoy them! It's also good for me to be stacked and stretched, to be forced to weave to avoid being punched, to block with speed, react, and counter - it all helps me keep my balance! It's ALL GREAT exercise for me and I love it. It’s amazing rehabilitation, so if someone doesn't know me well and is easy on me, then they’re actually being detrimental to my health. Equally, I don't want to make someone uncomfortable if they aren’t happy to punch, kick, throw, takedown, choke, or submit me - the lesson in this is to please talk to me first, or my teammates - they’ll tell you I love the nasty side! And yes, all my doctors and consultants fully support my pursuit in sports! Who are the people on your team, or that you feel like support you very much? The least thanked teammate I have who should be recognized, is now my husband. After Grappler's Heart 2015, I managed to hook him. He’s taken the blunt end of my being so competitive and ambitious. I have to thank my current coach Professor Salvatore Pace and the whole team. Salvatore is the perfect coach to train me. While I have so many people to thank, he helped me find love again in the sport when I was feeling very low. I've found that a real team is exactly that: one that doesn't function without every member and with no prerequisites. That’s what I have now. I sincerely thank everyone who has helped me on my journey. I do feel like I am in the place to flourish, which wouldn't have occurred without the people who have supported me. I have to pay special recognition to Graham Barlow, who would often help me prep by imitating various types of people I would be competiting against, to the point some of the kids thought it was fun to try the different techniques by tying up their legs! That was so brilliant, and the students embraced it at an open mat session! As a role model for other women, young girls, and adaptive athletes, what is the legacy you’d like to leave behind? The legacy I want to leave behind is that of Adaptive Martial Arts. I hope it thrives and continues with high-caliber coaches who engage others to just try! That's my passion and drive. If I leave nothing else in this world, I want people to use me as an example of taking every opportunity presented to you! Don't think you can’t until you’ve exhausted every avenue, especially with sport and exercise. I also want non-adaptive and male-dominated sports to recognize that #wewanttoplaytoo! What does being an adaptive athlete mean to you? It's my life and my everything. I’ve always been active and into sport. It's been my choice of academia for 7 years. My life revolves around inspiring others or creating opportunities for others. For example, after hassling the local adaptive strongman competition to put on a women division, it's now being recognized by the governing body and has had to be included in the national competition - that’s what I call results! It has gained me respect and contentment as well as providing new opportunities to those growing up, hopefully with more advanced procedures and protocols! I would change some things, sure, but I honestly wouldn't want to be non-adaptive. I want to empower everyone, would it have been different if I was different?